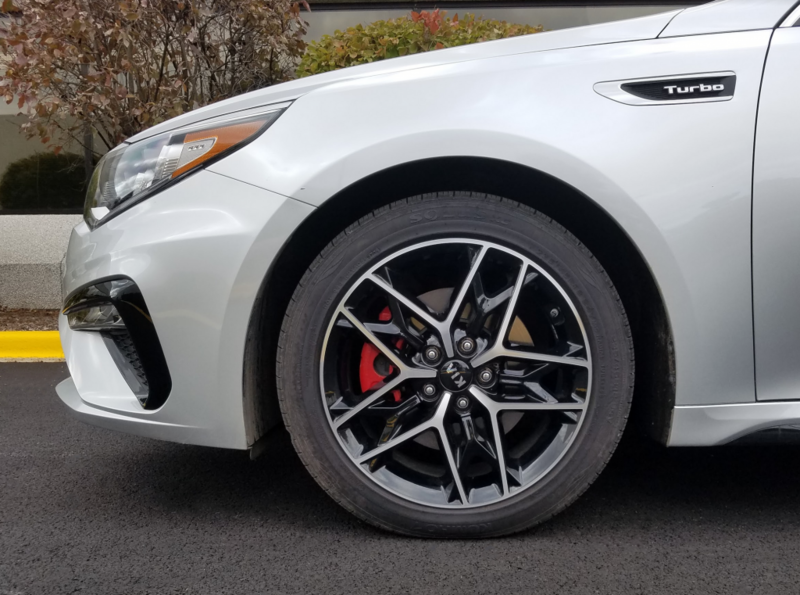 It’s the little things that count for the Kia Optima in 2019. The midsize sedan gets freshened up with redone lower fasciae front and rear, a driver-attention monitor, and a revised and expanded series of UVO infotainment systems. 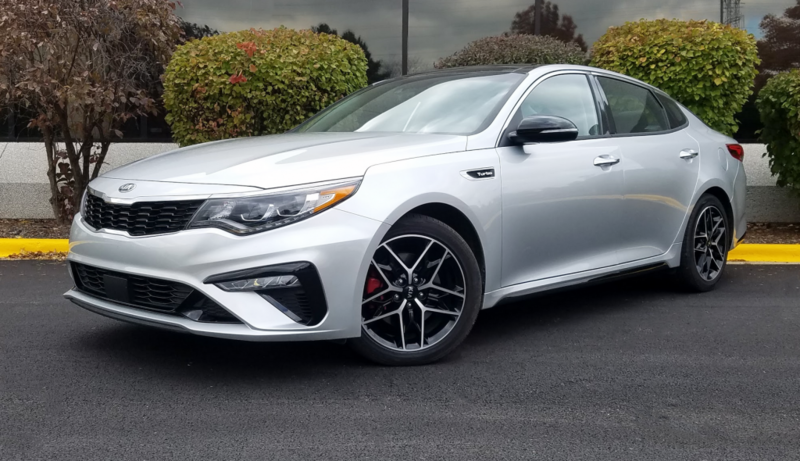 The biggest thing about the ’19 Optima, in terms of features and price, is the SX Turbo. 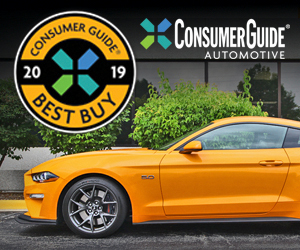 It’s the top of the 4-tier model roster, it’s the only one with a base price north of $30,000, and it’s the version that Consumer Guide editors got to drive for this test. The SX Turbo comes standard with sporty touches such as a rear spoiler, red brake calipers, dual exhaust outlets, gloss black rocker-panel sills, and a gloss black honeycomb grille. A panoramic sunroof is also standard. With delivery, the starting tab is $32,820. That buys an Optima owner the most powerful engine available for the model line, a 6-speed automatic transmission, a sport-tuned suspension, and 18-inch gloss-black alloy wheels. Other gloss-black exterior highlights are the honeycomb grille (a new touch for ’19), side sills, power-mirror caps, and rear spoiler. Headlights are LEDs with Dynamic Bending Light. The Optima’s dashboard boasts a clean, straightforward layout that’s easy to use. The SX Turbo’s sporty trim touches–such as red stitching and available red upholstery inserts–help liven up the ambiance. Luxury and convenience items run to a panoramic sunroof with LED interior overhead lighting, leather upholstery, heated and ventilated power front seats, driver’s-position memory system for seat and mirrors, heated and leather-wrapped flat-bottom sport steering wheel, dual-zone automatic climate control, remote keyless entry, push-button starting, adaptive cruise control, UVO link with navigation, Apple CarPlay/Android Auto smartphone connectivity, and a 10-speaker Harman Kardon premium sound system. Safety and driver-notification systems are blind-spot and rear cross-traffic alerts, rear parking sensors, forward collision alert and autonomous emergency braking, lane-departure warning, lane-keeping assist, and lane-change assist. The Optima offers 15.9 cubic feet of trunk space–not class-leading, but on par with most competitors. Shoppers who’d like to spend more certainly can. The test car didn’t come with the Limited Package, but this $3800 group for the SX adds interior upgrades, chrome exterior accents, and more. There also are 11 cargo, lighting, and finish-protection options priced from $30 to $300 apiece. The interior of CG’s Sparkling Silver test car was clad in a black-and-red interior ensemble that’s new for the Optima SX in 2019. Even without the scarlet inserts on the cushions and seat backs, and in the door panels, the car comes with red accent stitching on the seat seams, steering-wheel wrap, and shifter boot. However, the big swaths of vibrant contrast color enliven what could otherwise look a little stark. There’s a muted satin-chrome panel atop the center console, but applications of bright metal are scarce. Soft-surface material with some underlying give is deployed on the top of the dash, on the arm rests and door centers, and—commendably—on the tops of all four doors. Aside from being attractive, the seats are comfortable with good support. The front two should welcome most adults with quite good legroom. Headroom is more than adequate even under the sunroof. Unless the front seats are virtually all the way back, the rear seat has acceptable space for 6-footers, and good room for folks not quite that tall. Three adults might sit shoulder-to-shoulder across the back seat—a low, flat floor tunnel helps here—but the middle one ought to be on the shorter side. Drivers can count on good sightlines to just about anywhere except perhaps the rear-roof-pillar area. Small-item storage space in the interior relies on a big glove box, pockets and bottle holders on the doors, and a pocket on the back of each front seat. Moving from front to back in the redone console there’s a covered bin that holds the auxiliary audio jack, a USB port, and two power outlets; twin open cup holders; and a deep covered console box with an upper tray. The pull-down center armrest in the back seat is equipped with a pair of cup holders. Legible gauges are set deep into the instrument cluster. All Optimas now have an 8-inch color touchscreen in the center of the dash. The infotainment system with navigation in the SX has all the UVO bells and whistles, including an AM/FM radio, MP3 player, and HD and satellite radio. Creating and accessing audio presets is as easy as ever. Separate climate controls use rotating dials to set temperature but rely on buttons for other tasks. The SX gets the top powertrain in the Optima lineup: a 245-horsepower turbocharged 2.0-liter 4-cylinder. 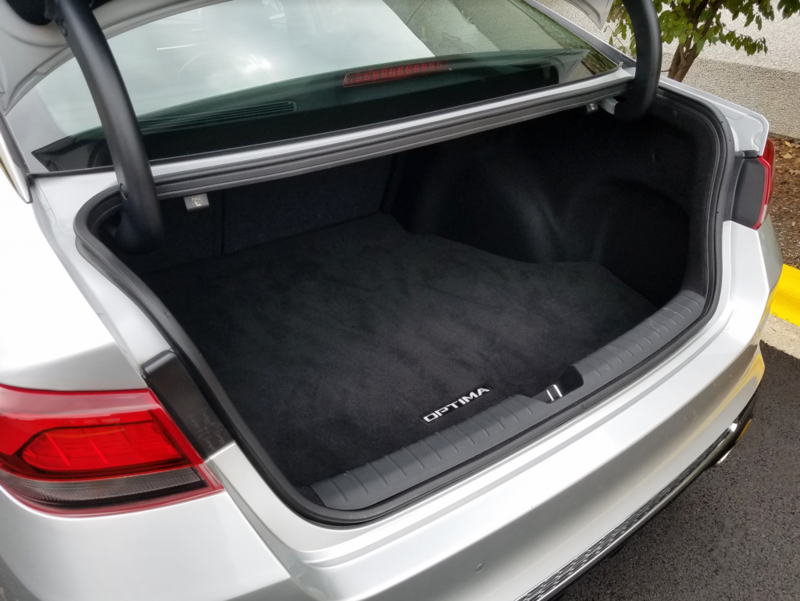 Trunk space is fairly average for the class, but no standout. The floor narrows quite a bit between the wheel houses, and a high sill portends strain when unloading. The rear seat backs retract nearly flat in a 60/40 split, but they rest a few inches above the level of the trunk floor. Plus, there’s a bulkhead behind the seats that somewhat constricts the threshold from trunk to interior. Eighteen-inch alloy wheels and a sport-tuned suspension are standard SX features. The test car’s powerteam is a familiar one for the current-generation Optima, but it is exclusive to the SX. The 245-horsepower turbo four with 260 lb-ft of torque is the strongest of the three available Optima powerplants. Performance changes with the selectable drive modes. Base “Comfort” effects smooth takeoffs and permits easy cruising. (An “Eco” setting squeezes more fuel economy from around-town driving at some loss of zest.) Clicking into “Sport” calls up notably quicker throttle response and stronger acceleration—to this driver, Sport mode made the car seem to start coming to life above 2000 rpm, a good 1000 revs before the same was felt in Comfort. However, in stop-and-go driving Sport mode’s speedier pedal response at each new start can make the trip feel somewhat jerky. The 6-speed automatic transmission works smoothly and downshifts quickly. Steering-wheel-mounted paddle shifters are provided for hands-on types. EPA mileage estimates are 21 mpg in city driving, 30 mpg on the highway, and 24 combined. This reviewer recorded 19.4 mpg after a 201-mile stint made up of two-thirds city-style driving. The SX’s sport suspension still delivered a calm expressway ride in Comfort mode. Ride is a little firmer—but not harsh—in Sport, which also delivers sharper steering with better feel than in the base setting. Good brakes provide stable stops. The SX’s price tag may be the biggest of all the Optimas, but it’s a lot of little things that add up to make it a worthwhile choice for shoppers to consider. 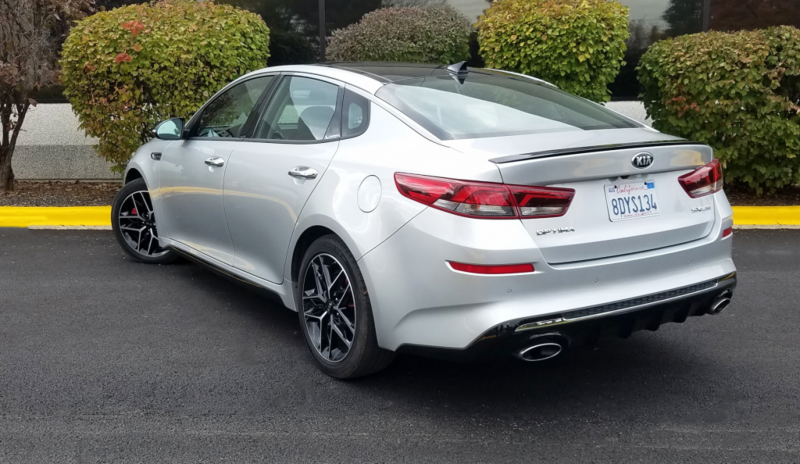 The 2019 Kia Optima SX Turbo is a practical family sedan that offers sporty styling inside and out; peppy acceleration; and a generous list of standard comfort, convenience, and safety features. It costs at least a couple thousand dollars less than comparably equipped competitors with similar power, but its fuel-economy numbers can’t quite match those rivals. Written by: The Daily Drive staff on January 18, 2019.